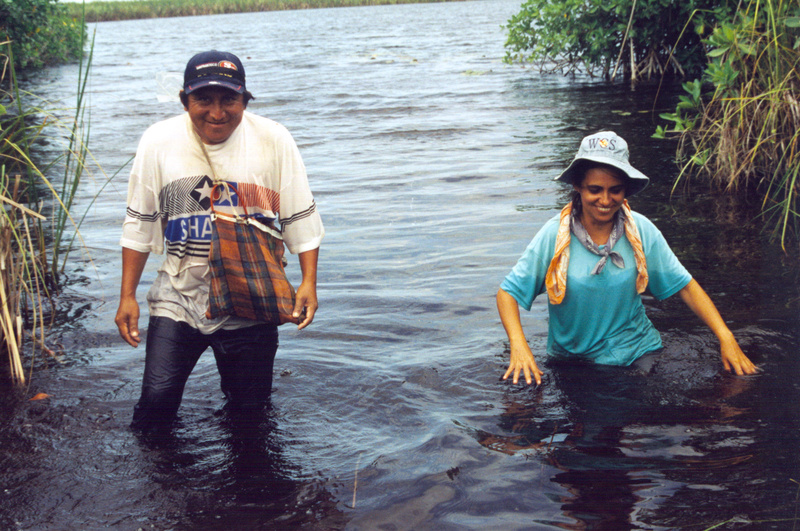 A. Minerva Arce-Ibarra works at the Department of Systematics and Aquatic Ecology of the College of Southern Border (ECOSUR, www.ecosur.mx). She holds a BSc. in Fisheries Biology (UAS), an MSc. in Marine Biology (CINVESTAV-Mérida) and a Ph.D. in Interdisciplinary Studies (Dalhousie University). Her Ph.D. thesis addressed livelihoods, aquatic resources and non-monetary values in the Lowland Maya area. From 2001 to 2011 Minerva was in the Steering Committee of the program "COMPACT-UNDP (Sian Ka'an)"; and from 2009 to 2012, she was the Director of ECOSUR Campus Chetumal. Since 1996, Minerva holds a Researcher/Professor position at ECOSUR wherein she is a lecturer of several courses including “Ecological economics” and “Transdisciplinary approaches for small scale fisheries”. She is an evaluator of CONACYT grant proposals and peer reviewer of Mexican and international journals. Also, she has been participating as peer of grants (2015) of the National Marine Fisheries Service and was also reviewer of a spiny lobster project (2016) from Ecuador (ULEAM). Since February 2018, she as been the Associate Editor at the peer reviewed journal “Sociedad y Ambiente” which is indexed by CONACYT. Q: 1. What are you currently working on within the context of SSF? MA: From 2015 to 2017 I have been participating in TBTI transdisciplinary cluster to develop a course on “Transdisciplinary Approach for Sustainable Small-Scale Fisheries”. In Mexico, I undertake collaborative work with a team of experts in several areas, notably in Sustainable Maya rainforest. Therein inland fishing is pursued by Maya peasants in karstic water bodies interspersed in the forest. This work ranges from multidisciplinary to transdisciplinary approaches, depending of the degree of integration of the addressed subject and interest of the participants. I also work on coastal community-based fisheries management focused on the coasts of Quintana Roo. In both, inland and coastal areas we are addressing the meanings and motivations for conservation of community groups which are themes within a project called “Community Conservation Research Network” (Saint Mary’s University, Canada). MA: I think that it depends on the context of every small scale fishery (SSF). For instance, there are many SSF that have shown a considerable degree of successful community-based management, like the spiny lobster of Punta Allen, Mexico, but still it has been affected by climatic variability - such as the heavy rains of 2013 - that affected their catches in the following year. Therefore, addressing climatic variability will be one factor for securing sustainability of SSF worldwide. Another factor would be good collaborative work and commitment from interactive actors that deal with SSF governability; this could be represented by devolving authority to local community groups to manage their SSF.